The Oklahoma City Thunder currently sit third in the Western Conference Standings and according to Royce Young of ESPN, Billy Donovan's men are set to announce a new acquisition in Markieff Morris. Morris has been sidelined since Dec. 26 after being diagnosed with transient cervical neurapraxia. On Monday, he sought a second opinion from renowned spine specialist Dr. Robert Watkins of Los Angeles and was cleared to resume full basketball activities. Morris played college basketball at the University of Kansas before being drafted in the first round of the 2011 draft by the Phoenix Suns. 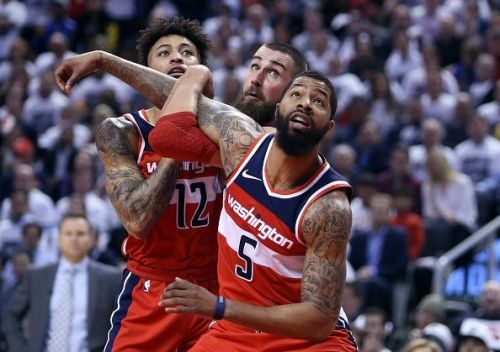 After spending five years in Phoenix, the 6-foot-10 forward joined the Washington Wizards in 2016, and Morris spent three seasons with the team before being traded to the New Orleans Pelicans earlier this month. The Pelicans waived Morris just a day later, and the OKC Thunder have since fended off competition from the likes of the Los Angeles Lakers in order to secure the services of the experienced power forward. After waiving Alex Abrines earlier this month, the Thunder needed to add depth, and Morris looks to be a great addition. Despite being primarily used from the bench this season, Morris has averaged 11.5 points, 5.1 rebounds and 1.8 assists in 34 games, and the veteran should prove to be a great backup to the impressive Jerami Grant. Next up for the Oklahoma City Thunder are the Utah Jazz, the team that knocked Russell Westbrook and company out of the 2018 playoffs. The Thunder also face a tough game against the Sacramento Kings just 24 hours later.